Earl Bamber, Timo Berhard and Brendon Hartley scored their fourth consecutive victory in the 2017 FIA World Endurance Championship season by winning the 6 hours of Circuit of the Americas. 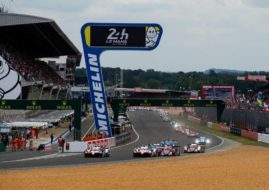 A crew in the #2 Porsche 919 Hybrid beat their teammates Neel Jani, Andre Lotterer and Nick Tandy in the #1 Porsche to score third in a row 1-2 victory for Porsche this season. The #1 crew started the race from pole position and led for most of the race before letting the sister car ahead in the closing stages to improve their position in the championship standings. Bamber/Bernhard/Hartley are the current championship leaders ahead of Toyota’s Sebastien Buemi and Kazuki Nakajima, who finished third in Texas, joined by Stephane Sarrazin as a replacement for Anthony Davidson in the #8 Toyota TS050 Hybrid. After six rounds, Porsche scored 242 points in the manufacturers’ world championship with Toyota on 168.5 points. In the drivers’ rankings, Bamber/Bernhard/Hartley collected 159 points, 51 more than Buemi/Nakajima. Nicolas Lapierre, Gustavo Menezes and Andre Negrao are the LMP2 class winners in the #36 Signatech Alpine car, beating two Rebellion Racing crews (#13 and #31) by one lap. It’s the first season’s win for the #36 Alpine A470-Gibson. James Calado and Alessandro Pier Guidi scored their second GTE Pro class victory of the season in the #51 AF Corse Ferrari 488 GTE. Their teammates Davide Rigon and Sam Bird joined them on a podium, finishing third. Porsche’s Michael Christensen and Kevin Estre were second. The #98 Aston Martin Vantage was the victorious car in the GTE Am class for the second time this year, driven by Paul dalla Lana, Pedro Lamy and Mathias Lauda.